Creating a stylish, simple & handmade home. I’m back today with the ‘afters’ of Maya’s closet. We tried to keep this one on budget, and I’m pretty happy with the way it turned out. It is pretty but also packs in function. We still have some room to grow into it. 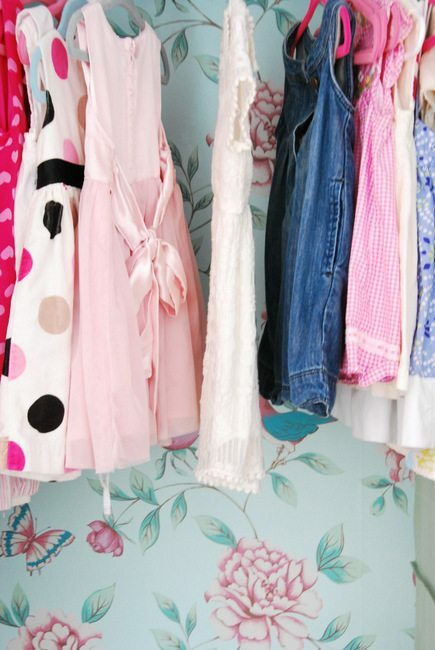 She definitely has the nicest closet in the house – lucky little lady! 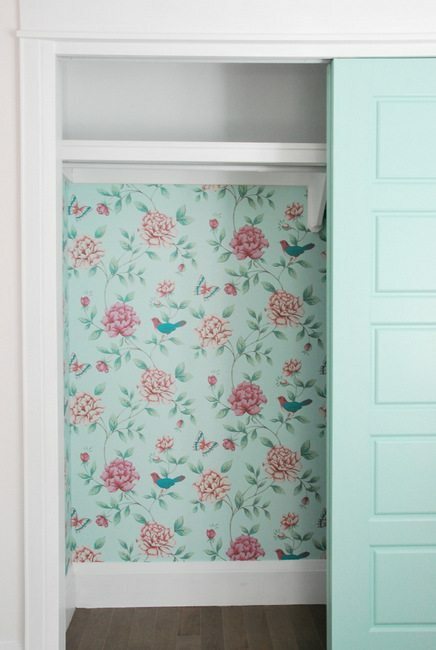 After wallpapering the closet in Graham & Brown’s gorgeous Isabelle Blue paper – you can catch all my wallpaper 101 tips and tricks in that post – it was time to finish putting the closet together. Here is a reminder of what we were starting with. We built that top shelf using MDF and purchased the railing from the hardware store. And here it is post-painting and wallpapering, below. 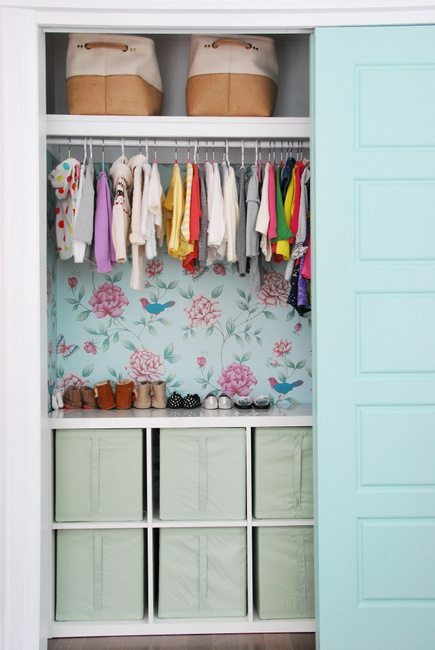 The whole scheme of the closet is colourful, pretty, and reminds me of an English garden. Graham & Brown’s September trend, “Horizon”, was all about taking inspiration of nature into your interior design scheme and I think this totally fits the bill. It feels like you’re opening the door into a pretty garden and comes off all fresh and sweet. In order to figure out what made the most sense for how to lay out the closet, we wrote out a list of what we would be wanting to store in there. In her dresser, Maya has her tee-shirts, long sleeve shirts, pants/leggings, and PJs. All other clothing items (socks, underwear, shorts, sweaters, dresses, etc) were for the closet, but in addition to that I wanted to be able to put away all of her “accessories” (head bands, bracelets, etc), diapers and wipes, her carrier, extra blankets and linens, and awkward stuff like her lifejacket. 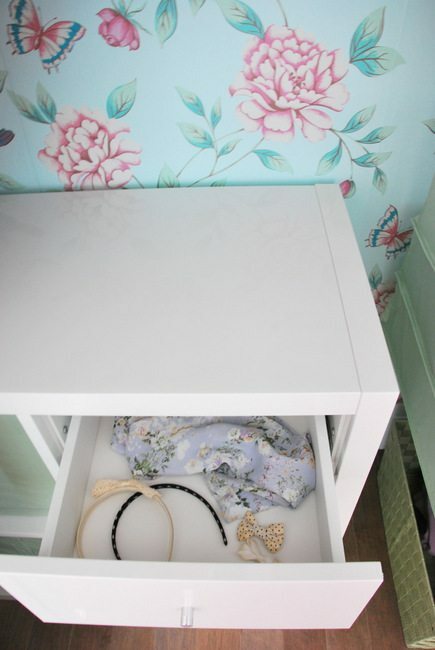 The other thing that we took into consideration was the longevity of the interior fittings – we wanted the closet to be able to grow with her and accommodate her changing storage needs. We had already built the one shelf at the top and installed a long rod along the length of the closet. Instead of doing a double railing or anything else built-in, we opted to go for an IKEA Kallax unit. This would mean we could have a mixture of pull-out baskets, drawers, and the top shelf of the unit for shoes. Because it isn’t built-in, it’s easy to move out down the road if Maya ends up wanting to switch things up. 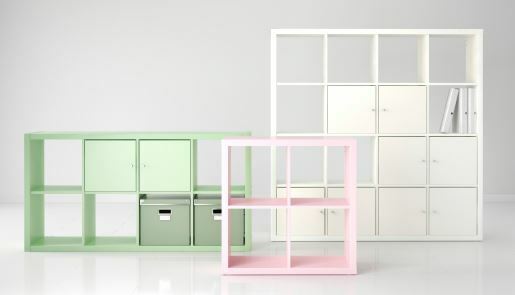 We used the two by four kallax unit in high gloss white (this one), which runs about $100. We paired it with the Skubb baskets in light green (these – $18 for three), four Kallax drawer units (that fit into 2 of the box spaces), and also decided to get a Skubb hanging multi-shelf in the same green (this guy – costs $10). 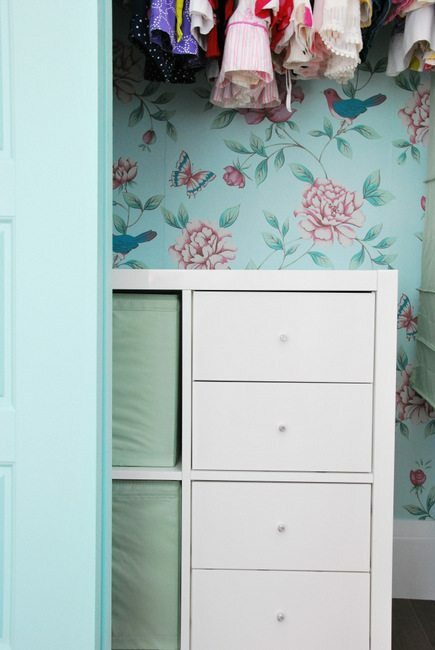 The light green just happened to go so nicely with the floral paper and minty doors. A couple of big bins on the top shelf (got those from HomeSense) help to organize some of the bulkier stuff on the upper shelf. 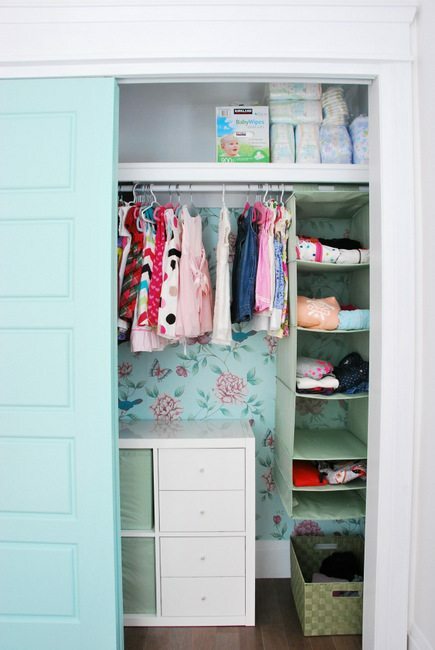 It’s REALLY nice not to have to store big boxes of diapers and wipes somewhere else. They are bulky and annoying, and it is nice to be able to shove them into a closet out of sight. See that basket on the floor under the hanging shelves? It’s meant for the clothes that Maya grows out of. I organize her clothes into bins according to age, and it’s annoying to do a trip up to the storage area and haul out the appropriate bin when she has just grown out of one or two things. Rather than throwing them on the floor as I had been doing, having a dedicated bin where I can put them until I have a sec to transfer them upstairs has been hugely handy. So for a few hundred dollars and no complicated install, we have this sweet closet for Maya that keeps things super organized (which makes mama all kinds of happy), and will grow with our girl over time. Have you guys used any closet systems in your place? Ever wallpapered one? 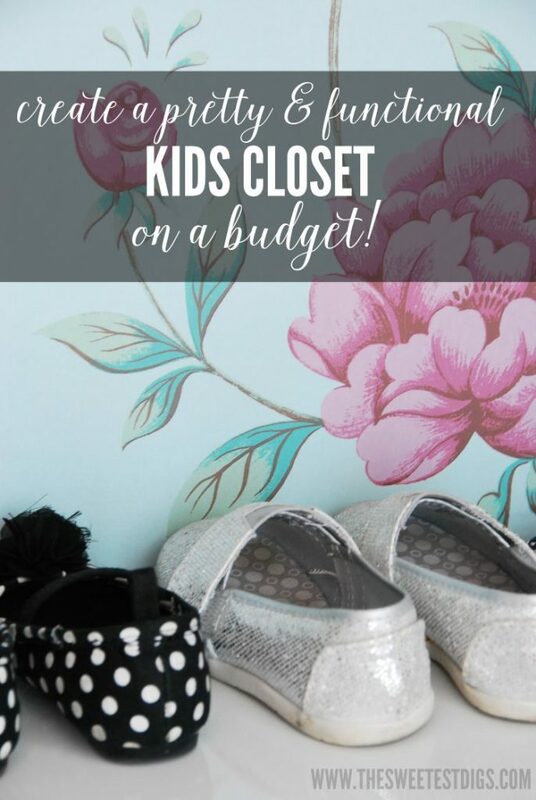 Have tips on keeping kids things organized? I’d love to hear about it! Oh gosh – I so get it, Kelly! You don’t even want to *see* what my closet looks like. Good luck with your reno! Wow, can you come and design my closet? We forgot to budget closet fittings into our reno budget. Ooops. The wallpaper and painted door are amazing. And the fact that its stylish and functional well all the better! Thanks Marci! It’s definitely one of those things that you can kind of forget when budgeting, eh? We found this setup to be really reasonably priced compared to big built-in systems (and we didn’t love the idea of the cheaper wire ones). Good luck with yours! Thanks Anni! We are liking the configuration so much, that I think we are going to completely copy it for baby #2’s room as well. Good luck with your kiddos spaces! How beautiful! 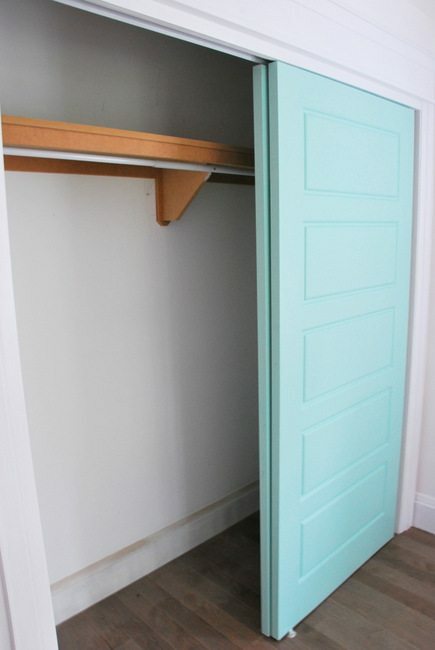 Great idea and inspires me to fix up my own closet!! What color are the doors? Hey! I'm Gemma. I'm all about helping you create a stylish, pinterest-worthy, all-natural home you LOVE. Let's obsess over decorating, DIY projects, simplifying, and toxin-free recipes together, k? Sweet, we're already BFFs. Get in on my VIP section where I upload all the art printables, design guides, organizational printables and basically everything I have ever designed for my readers! Success! Now check your email for the password to get in.